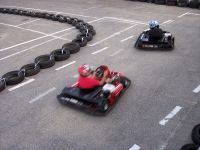 Go-kart track ADRENALINE invites all motoring enthusiasts at the exciting kart rides. 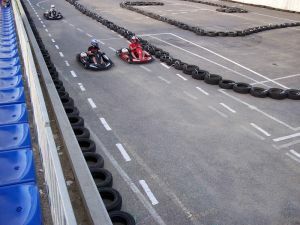 Go-cart track "Adrenalina" is run by Mariusz Nykaza hereinafter referred to as the Organizer. Before the introduction on the track participants and their caregivers should read the Rules of the track and accept them. Payment of admission fee is equivalent with the statement that track participants and their caregivers are familiar with the Rules, accept it and are aware of its consequences. The track can be used by people over the age of 8 years. Participants under 16 years of age may use the track only with the consent of their guardians. 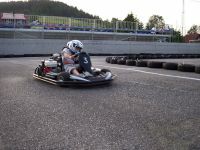 To use the track, it is necessary to pay admission fees and participate in some training. In special cases, the Organizer may deprive a person of driving, if that person is in breach of rules or do not apply to injunctions and guidance of the Organizer. 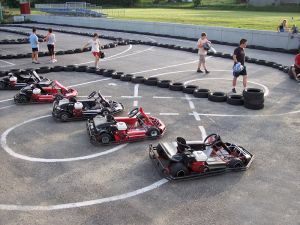 Participant shall ensure that they are not under the influence of alcohol, narcotics, drugs and medicines and other measures that could affect the response to go-kart driving vehicle. He also ensures that there are no other circumstances which could adversely affect the way of driving. The Organizer may refuse admittance to a person, whom he suspects of not complying to these terms and conditions ( he may do so without conducting additional tests (tests)). A participant taking part in the ride, and suspected of being under the influence of the measures mentioned above, will be immediately removed from the track without a refund. Under no circumstances Participant are allowed to leave their vehicles during the drive (race). In the case of stopping the vehicle or it’s breakdown, designated staff of the track shall provide assistance service. Before entering the vehicle loose garments (shawls, scarves, loose blouses, etc.) must be thoroughly covered that could not be caught in moving parts of the drive. This also applies to long hair which must be tied. Also, it must be remembered about good running shoes. Participants in a flip or other loose shoes will not be allowed to drive. It is strictly prohibited to withhold other vehicles. In case of such incidents the Organizer may stop the race or immobilize the vehicle. It is the participant’s responsibility to wear a protective helmet, start after the appropriate signal, stop immediately after the signal of the end of the ride, be cautious, not to drive in the opposite direction than that set by the Organizer. 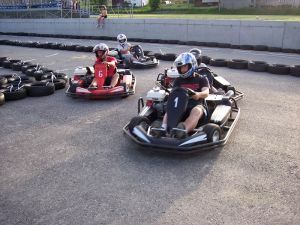 Participant acknowledge that the power unit is located next to the kart seat on the rear right side of the vehicle, to which attention should be paid due to the temperature that is achieved and to avoid accidental burns. The participant is obliged to inform the Organizer of irregularities or failures and damage of the vehicle. The participant shall have full civil and criminal liability for damages caused by him during the use of the track. Each of the participants enjoy the track on his own responsibility and in the event of any injury shall have no claim to the Organizer. The Organizer accepts no responsibility for injuries arising from non-compliance of Participants to the Regulations, orders and instructions manual. In addition, the Organizer is not obliged to substitute a new vehicle to replace the damaged one. The Organiser reserves the right to exclude Participant from race without giving any reason. Prices for admission and driving time are set by the Organizer. The organizer also choose the number of vehicles on the track, running order and time interval between the taking-off, he also has the right to stop the race (ride) at any time without refund of entry fee. All decisions of the Organizer are final. Invalidation of any of the points does not invalidate the whole of the Rules. In matters not regulated by these regulations the Civil Code regulation will be applied.